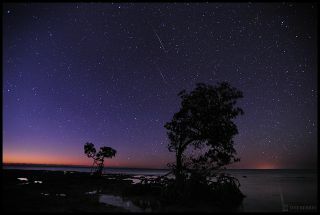 Photographer Jeff Berkes captured several Quadrantid meteors in this long-exposure image taken in the Florida Keys on Jan. 2, 2012, during the annual Quadrantid meteor shower. The 2017 Quadrantids will peak on Jan. 3 and 4. Early each January, the Quadrantid meteor stream provides one of the most intense annual meteor displays, with a brief, sharp maximum lasting only a few hours. And in 2017, viewing circumstances favor North Americans, especially those living west of the Mississippi River. Adolphe Quetelet of Brussels Observatory discovered the Quadrantid meteor shower in the 1830s, and shortly afterward several astronomers in Europe and America noted it. Thus, the meteors were christened "Quadrantids," and even though the constellation from which these meteors appear to radiate no longer exists, the shower's original moniker continues to this day. At greatest activity, 60 to 120 shower members per hour should be seen. However, the Quadrantid influx is sharply peaked: 6 hours before and after maximum, these blue meteors — a color that results from layers of magnesium burning up during the meteors' entry into Earth's atmosphere — appear at only half of their highest rates. This means that the stream of particles is a narrow one, possibly derived relatively recently from a small comet. In fact, in 2003, astronomer Peter Jenniskens of NASA found the near-Earth asteroid 2003 EH1, which seemed like it was on the right orbit to make the Quadrantids. Some astronomers have said that this asteroid is really a piece of an old, "extinct" comet, perhaps one recorded by Chinese, Korean and Japanese observers during the years 1490-91. Maybe that comet broke apart and some of the pieces became the meteoroids that make up the Quadrantid stream. The Quadrantid meteor shower of 2017 will peak on Jan. 3 and 4. This NASA sky-map shows where the shower will appear to radiate out from. In 2017, a strong display of Quadrantid meteors is likely for North America, particularly over the western half of the continent. Maximum activity is expected at around 1400 GMT on Tuesday, Jan. 3; that corresponds to 9 a.m. Eastern Time, 6 a.m. Pacific Time. Just before the break of dawn, the radiant of this shower — the spot from which the meteors appear to emanate — will be ascending the dark northeastern sky. Those who live in the eastern half of North America will see the "Quads" increase in intensity before bright morning twilight and sunrise intervenes, with a single observer likely to see rates of 30 to 60 meteors per hour. For those who live in the western half of North America, meteor rates will probably be even higher, very close to the peak rates of 60 to 120 per hour. With no moonlight to interfere, this might be one of the best meteor displays of the year. But be sure to bundle up! Lastly, and I've touched on this point before, but certainly it should be addressed again: Likely, your local weather will be more appropriate for taking a hot bath as opposed to a meteor shower. And indeed, at this time of year, meteor watching can be a long, cold business. You wait and you wait for meteors to appear, outside in the cold. When they don't appear right away, and if you're cold and uncomfortable, you're not going to be looking for meteors for very long! Therefore, make sure you're warm and comfortable. Warm cocoa or coffee can take the edge off the chill, as well as provide a slight stimulus. It's even better if you can observe with friends. That way, you can cover more sky. Good luck and enjoy this meteor show(er)! Editor's note: If you capture an amazing photo of the Quadrantid meteor shower that you'd like to share with Space.com and our news partners for a possible story or image gallery, send images and comments in to: spacephotos@space.com. Joe Rao serves as an instructor and guest lecturer at New York's Hayden Planetarium. He writes about astronomy for Natural History magazine, the Farmer's Almanac and other publications, and he is also an on-camera meteorologist for Fios1 News in Rye Brook, NY. Follow us @Spacedotcom, Facebook and Google+. Original article on Space.com.